The HORAO project asks the most brilliant minds to develop new technologies, that will help visualize the exact border between the tumor and the healthy brain tissue during brain tumor surgery. Surgery is the crucial treatment step for most patients with brain tumors. A clear identification of the fine border between the tumor and the surrounding brain is essential in order to radically resect the tumor and to preserve neurological function. However, while easy to identify in preoperative MRI, solid tumor tissue is often difficult to differentiate from infiltrated white matter during surgery. Our goal is to improve delineation of brain tumors during surgery. Instead of focusing on the difficult to detect tumor itself, we focus on identifying healthy white matter by means of its tracts. The brains entire white matter is made up of fiber tracts that comprise bundles of axons. This high degree of structure in white matter differentiates white matter from brain tumors, which do not have a similar structure but are largely chaotic. Though, this difference in structural complexity or entropy is currently not detectable during surgery with white light operative microscope, under which both appear similarly homogeneous. The ability to easily identify white matter fiber tracts in real time during surgery would improve delineation of tumors from the surrounding brain, which would increase the likelihood of removing the complete lesion and decrease the risks of harming the surrounding brain tissue. In addition, visualization of fiber tracts leads to better localization and orientation during surgery. Neuroscience has yet failed to deliver the required technology. But we are convinced that someone already has the solution at hand or in his mind. Anyway, we need to raise the awareness for this urgent problem. With your support we are able to launch a global prize-based crowdsourcing competition, that asks the most brilliant scientists to develop new technologies. YOU WILL BE REWARDED - including the possibility to accompany the team of neurosurgeons at the Inselspital, Bern University Hospital for a day. This project ended successfully on 18/9/2017 17:00! Get the «I fight brain tumors - what`s your superpower?» Postcard - signed by the team. Sei ein Held - und unterstütze als engagierter Leser das Forschungsprojekt HORAO! Zusätzlich erhältst Du die «I fight brain tumors - what`s your superpower?» Karte als Dank! Visit Martina von Meyenburg in her studio in Zürich. Explore the world of an artist and take part in a dialog on boundaries with a glass of wine! You will receive a personal Thank You Postcard and a set of HORAO Band-aids! Nimm Teil an einer Führung durch die Neurochirurgische Klinik des Inselspitals und erhalte einen einmaligen Einblick in den Alltag von Neurochirurgen. Get the unique «I fight brain tumors - what`s your superpower?» t-shirt! Receive your personal copy of Henry Marsh`s bestseller «Do No Harm», gratefully signed by the HORAO team. You`ll get invited to the scientific conference where the finalists of the crowd sourcing campaign present their projects. Learn to operate like a neurosurgeon - receive neurosurgical training in the skills lab! Learn how to use micro-instruments, clip aneurysms and fix the spine. A day with the team! You receive a personal invitation to visit the neurosurgical department of the Inselspital, Bern University Hospital. Martina`s work focuses on boundaries & borders, where differences and similarities become visible. Receive a unique artwork, exclusively made for you and the HORAO project! Your generosity for cancer research earns you the ultimate package. You will receive all of the above including a personal invitation to visit the neurosurgical department of the Inselspital, Bern University Hospital. On top of this the surgical team will take you out for dinner to any restaurant of your choice in Bern, and you will be named chief sponsor of the HORAO project! 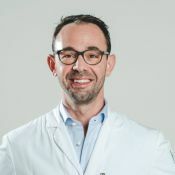 Philippe is a Swiss neurosurgeon who previously worked in South Africa, the South of France and San Francisco. 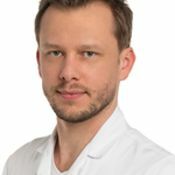 He`s a professor in Switzerland where he operates, teaches and coordinates Neuro-oncology. His free time he enjoys spending in Myanmar, where he operates and educates young doctors. He won several grants and awards for his research on brain tumors and is a Harvard Alumni. 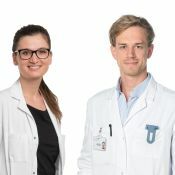 Johannes Goldberg and Irena Zubak are neurosurgical residents at Inselspital, Bern University Hospital. Their special interests include the treatment of brain tumor patients and the search for its improvement.